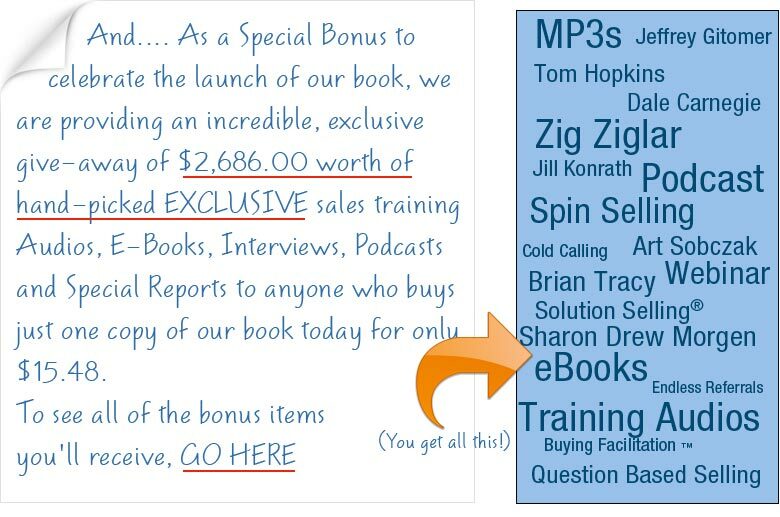 Get access to $2,686 of Free Sales Training Bonus Items. Step 1, Bookmark this page. Step 3, click on the button below. Achieving Higher Profits In Any Economy, Against Any Competition For Any Sales Person or Business Owner From the Most Successful Sales Trainers in the World. No other resource gives you such depth AND breadth on so many sales-related topics, from so many experts – literally everything you need to know to become a Master of Selling and take your sales to a level you could only ever dream of before now. No matter how well you’re doing, you can be doing even better! No matter how many clients you have, you can have even more! And no matter how good your profits, we can push them even higher! You have nowhere near as many customers and sales as you would like! When you make your living in Sales, or the success of your business depends on Selling (and doesn’t every business, to some extent? ), you likely already know the value of constantly honing your knowledge and your attitude. But with the thousands of books out there on “Selling”, how can you be so sure you’re getting the best advice? And how do you separate the wheat from the chaff without spending your entire workday studying instead of selling … or sacrificing your family life for the sake of ‘continuing education’ and ‘professional development’? Because we’ve already done it for you. Here in one volume is all the most vital training you really need to maximize the profit-pulling power of your entire sales force … whether it’s a team of twenty, or only you. And together with my co-author David Riklan, I want to invite you to finally join the ranks of the Master Sales Professionals – those who know how to instantly use any strategy, tactic, or technological advancement available … to handle all objections, turn any situation to their advantage, and make those “tricky” sales that would blow most salespeople right out of the water. Our goal in creating Mastering the World of Selling is simple, clear, and focused: To help you sell whatever you have better … faster … smarter … in greater quantities … with more profit than ever before … and building you into an extremely successful Sales Professional! This guide is about to become your ultimate sales tool. This is the stuff we KNOW will benefit you … because we use it ourselves every day, right there in the trenches … fighting to gain more market share and keep our existing client base. And now you too can put such stars of Selling as Zig Ziglar, Tom Hopkins, Jeffrey Gitomer, Brian Tracy, Jill Konrath, Charles H. Green, and dozens of others on your sales team today, with the one guide designed to replace an entire shelf of your Sales library! …and so … much … MORE! Sure that’s a lot … but it’s still only scratching the surface of what’s waiting for you here! We set out to over-deliver … and I believe we’ve even over-delivered on that. Detailed profiles and contact information to over 150 of the world’s greatest sales training resources. Access to hundreds of products and services, online resources, associations, and sales communities you can learn from and contribute to. Plan your opening – it sets the stage for the entire meeting. Qualifying is forever; anything and everything can change. Focus on improving the five critical selling skills: (1) buyer/seller relationship, (2) sales call planning, (3) questioning, (4) presenting, and (5) gaining commitment. Set a commitment objective for every call: A goal you set for yourself to gain agreement from the customer that moves the sales process forward. ‘Prescription before diagnosis’ is malpractice – any salesperson who attempts to sell a solution before fully understanding the customer’s needs, from the customer’s point of view, is engaging in sales malpractice. The Platinum Rule of Selling: Adjust your selling style to fit the customer’s buying style. People don’t buy because they’re made to understand; they buy because they feel understood. Expand your group of mentors by contacting older and newly-retired professionals to help you understand where your company is on its journey, help you understand the motivations of the lead characters, and give you a powerful endorsement. Invest in your selling skills: One of the key investments of your time resource needs to be in the sales skills development area. How effective are your scripts and dialogues that generate the lead and drive the lead to a sales appointment? Stand out from the competition by becoming a true business consultant: ask questions about the customer’s core business processes, and use the information to improve their key metrics. Build and sustain open, trusting relationships with a wide variety of different prospects and customers by learning how to be versatile in your communication style and adapting to each individual’s preferred interpersonal style. Invest the time to profile what your ideal customer looks like. Think about who is most likely to do business with you and why. The product is in the mind of the buyer – it doesn’t matter what you do; it only matters what the prospect thinks you do. And of course the whole works is fully indexed … giving you instant access to the help you need when you need it! Do you still remember all you’ve heard? And are you actually using it? …and the more perspectives and teaching styles we can gather together, the more powerfully effective this manual becomes in helping you achieve your sales goals. Just one good idea from the hundreds in this book can give you a tremendous competitive advantage and repay your investment many times over. In no time at all, you’ll begin transforming yourself into the selling powerhouse you were always meant to be. But you must act today! In Sales, as in all of Life, any opportunity is only as good as the action you put behind it. You know that … and we know it too. “He who hesitates” may not be lost … but he (or she) certainly loses out on far more sales and profits than the one taking action! …while it’s still fresh in your mind, and before the pressures of trying to make your quotas without it push the thought to the back burner. This exclusive Bonus Gift Package really is for fast-action-takers only. Please don’t throw this away senselessly. These bonus gifts alone could conceivably add thousands of dollars to your bottom line … month after month after month. …and you can be enjoying – and profiting from – your Fast-Action Gift Bundle within minutes from now while you await the arrival of your copy of Mastering the World of Selling. Here’s to your greater sales success! Co-Creator of "Mastering the World of Selling"
P.S. – Remember, you must act quickly to qualify for all these FREE Bonus Gifts worth thousands of dollars, for just the price of the book … so order today! Hear an audio recording from America’s motivator, Zig Ziglar. BONUS BOOK ONE: "The Seven Types of Prospectors"
BONUS BOOK TWO: "Leadership Mojo"
Get this 45-minute session & more from Jill Konrath, author of #1 Amazon bestseller, SNAP Selling. Recording of Scott Channel’s interview of Jacques Werth.